401(k) mistakes have the potential to easily ruin your retirement savings. If you have the opportunity to contribute to a 401(k) plan at work, hopefully, you’re taking advantage of it. But even if you do, most of us just hand over our money and don’t think any more of it. That’s a problem – potentially a big problem and one that can cost you thousands upon thousands of dollars if you’re not careful. If your employer is offering a match and you’re not contributing everything you can to reach that match, that’s one of the biggest 401(k) mistakes you can make. A better way to think about it is that if your employer offers 50 cents for every dollar you contribute, that’s a 50% return… and that’s before any growth happens! Where else can you get a guaranteed 50% return on your money as soon as you invest it? If you started with $0 in your 401(k) and just contributed $5,000 per year for 25 years with a 5% return, you’d end up with a balance of $250,567.27 in today’s dollars. Not bad, you say. That’s definitely a good start to retirement and can be even greater if you up your contribution every year. However, let’s up the ante a little bit. We’ll take the same scenario – $0 start, $5k contribution a year for 25 years, and a 5% return. But, now we’ll add something a little more fun – the employer contribution. In this example, we’ll say that your employer will throw in 50 cents on every dollar for you. Suddenly, your retirement balance becomes worth $375,850.90 in 25 years. Let’s say that again… $375,850.90!! Pretty significant increase in the account! Get your contributions up to whatever it takes to get to the max of what your employer offers. This might as well not be considered one of the 401(k) mistakes – it should be considered a sin! Ok, maybe it’s not that bad, but it’s a giant financial mistake, nonetheless. Don’t pass up on free money. When discussing 401(k) mistakes, you should be aware of a couple tax benefits. When I’m referring to 401(k) plans in this section, I’m speaking solely about traditional 401(k) plans and not Roth 401(k) plans. When you increase your 401(k) contributions, your take-home pay might not change at all. What?! Jim, is that really possible? Absolutely. You see, your 401(k) contributions are taken out before your taxes are. So if you increase your contribution, you actually lessen the money that you’re being taxed on with your paycheck. And the less money you’re being taxed on, the less you pay in taxes. It’ll be a little different for everyone, based on your salary, withholdings, etc., but chances are, increasing your 401(k) contribution by 1 or 2% may actually keep your take-home pay at or around the same amount it is now. To take advantage of this, you can do your homework and fill out a 401(k) contribution calculator. Or, you can just give it a shot and up your percentage a little bit. I’m guessing you’ll be happy you did. The other tax benefit to be aware of is that contributing to a pre-tax retirement plan like a 401(k) plan gives you a little bit of a boost in your savings ability. Here’s why: if you contribute a dollar to your 401(k) plan, you’re pushing it in without taxes being taken out – that’s a dollar in your plan straight out of the gate. If you were to save or invest money in another plan, like a savings account or Roth IRA, it would require after-tax dollars to be used. So a dollar in those plans might really have cost you something like $1.25. That dollar that you contribute to your 401(k) actually gives you more purchasing power. And the greater amount in the pot, the greater amount that can be compounded over time. As a side note, there’s an argument to be said about which is better in the long run – 401(k) plans or Roth IRAs. Both have their pros and cons and ideally, you probably should be contributing to both, but we’ll save that for a different post down the line. It’s time to find and eliminate costly fees in your plan. You’ve probably heard how 401(k) fees could be hurting your investments, but for a lot of us, we haven’t really thought too much of it. Maybe it’s because it seems complicated or because we don’t really know where to start. But be forewarned, one of the biggest 401(k) mistakes you can make is to not address the problematic fees in your plan. Jim, is this really that big of a deal? I mean, is a few hundred dollars here or there really going to make or break my retirement? I was in awe that 19% of my investment earnings were going to fees! If you don’t do care about this, I’ll just assume you’re filthy rich and normally use $100 bills as toilet paper. If that’s not the case, though, it’s time to fix the problem. And that’s where Personal Capital comes in! Personal Capital is a financial advisor and wealth management firm. What’s cool though is that they also offer some free services. The most important free service to discuss right now is that it can analyze your 401(k) and tell you what your invested funds will likely cost you in fees over time. 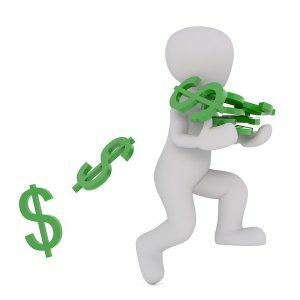 I linked my 401(k) plan and used their 401(k) Fee Analyzer to easily see what I was paying in fees. After the initial jaw-drop, I logged into my 401(k) provider’s website and switched all my funds to one low-cost target retirement fund. I re-ran the analyzer and that was it – mission accomplished… $53,000 richer over ten years! It took me about an hour to basically save over $53,000!! There’s really no reason not to do this. You might be able to save tens of thousands of dollars like I was able to do. And free is a perfect price to make this happen! Thank you Personal Capital! Jim, I understand that these fees can be costly, but they’re a drop in the bucket compared to the money I’m making in my managed funds! Who are these guys?!! They look like the mafia more than fund managers! Yeah, so, if you still have a 401(k) plan filled with managed funds, it might be time to re-evaluate. Managed funds are exactly what their name implies – a fund manager is in charge of determining the right investments that are going to make up the fund. The idea is that a smart and experienced fund manager can make you more money than you could otherwise. Here are the two problems with managed funds. First, they’re costly – very costly. Obviously, the people determining the investments for the funds get paid and they get paid through the fees they charge. I think I covered the fee problem pretty well in mistake #3. The second problem is that very few managed funds outperform index funds. And if they do, it’s even rarer that they can make that happen over the long haul. An analysis by Morningstar in 2015 found that fewer than 22% of large-cap stock funds beat the market over the 10-year period from 2005 to the end of 2014. Fees, of course, play the primary role in underperformance. Fewer than 10% of the highest-cost large cap stock funds beat the market, while nearly 30% of the lowest-cost large cap funds did so. For the average investor, the smarter move is to stick with index funds. Sure, they might not be as flashy as managed funds, but the expense ratio is much lower on them and, in the long run, you’ll likely come out further ahead than you would investing in managed funds. 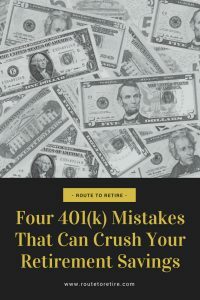 So there you are – four 401(k) mistakes that have the potential to destroy your retirement savings. Be careful you’re not a victim of any of them – your retirement is too valuable to succumb to mistakes like these that can be easily alleviated. Any other pitfalls you can think of that should be considered when it comes to 401(k) plans? I can think of another major benefit, it lowers your AGI and MAGI. A lot of tax benefits phase out at different income levels. A 401k contribution lowers this amount which could drop you below a cutoff. Awesome point, FTF! A drop into a lower tax bracket could save someone a ton of dough! You can also contribute enough to your 401k and end up lowering your income below the phase outs for traditional IRA contributions as well. 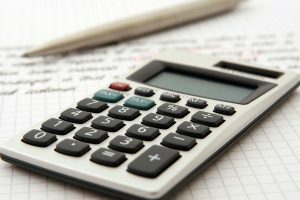 Maxing out your 401k, Traditional IRA, and HSA combined with your standard deduction / exemption can also bring you below the savers credit threshold, which saves you even more on taxes! Those are some good ones, David! I agree that keeping management fees to a minimum is key. I switched my 401k over to the Spartan 500 fund with Vanguard about a year ago because of fees. Also, nice tip on adding the 401k to personal capital. Nice job on the switch! 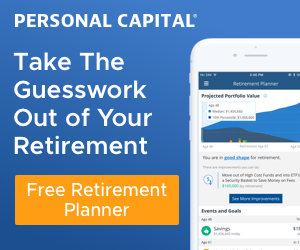 Personal Capital has some really cool tools that make it easy for users to manage their investments. I still love Quicken for my day-to-day finances, but I use Personal Capital on the investment side (it’s hard to beat!). I think the fees is the most easily forgotten one. I have yet to calculate how much the fees would cost me in the long run… I probably should :\ but seeing how I picked the ones with the least expense ratio, there wouldn’t be much I could do otherwise. Nice one on the Roth 401(k)! I started at this company in November of 2015, and then they decided to switch 401k companies! I had picked all my low fee stuff! They just took everything and rolled it into a target date fund, only that has one of the higher fee options. Once I was able to get into my account (they had a few days of lock out as the transfer happened), I picked all the Vanguard funds I could because they have the lowest fees. I would add a 5th tip about rolling your 401k to a rollover IRA if / when you leave a company during your working years. It let’s me keep everything in one place (Vanguard ). Nice job on the Vanguard funds, Jacq! That’s great that you have that as an option – unfortunately, a lot of plans still only offer funds with higher fees. That’s a great tip as well. Rolling over to an IRA also gives you the flexibility to choose what you want to invest in instead of being locked into just the choices your former employer allowed. I am lucky with the match at my company. We get a 100% match up to the first 5%. I work in HR and almost have to beg people to sign up. I tell them if you contribute 5% we match another 5% and that equals 10% going into your 403b. I tell them that they are leaving compensation on the table by not participating. It does not impact me, but I hate to see people not take advantage of this benefit. 100% match on 5% is definitely something folks shouldn’t be leaving on the table. It’s really amazing just how many people do exactly that though… scary actually.